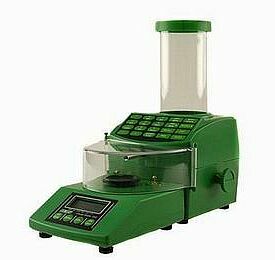 The RCBS Chargemaster 1500 Combo is the #1-selling electronic powder dispenser/scale system on the market. It was the top-performing unit in the Powder Dispenser Comparison Report we did a couple years back, and it still probably offers the best combination of features, speed, and weighing precision. Since its introduction, the RCBS Chargemaster has received a number of refinements. The internal software has been updated, the timing (of the powder drop) has been adjusted, the keypad has been upgraded and other smaller “tweaks” have been made. This video, created by a shooter in Norway, shows an RCBS Chargemaster dispensing 43.0 grains of Vihtavuori N140 powder. Using a Casio EX-F1 camera, the video was recorded at a high frame rate — up to 1200 frames per second. This allows very cool “Slow-Motion” playback. Check it out… you can see individual kernels of powder as they drop into the pan. At the end of the video you can watch the charge being thrown in “real-time”. Note how it slows down to trickle the last few tenths of a grain. Share the post "RCBS ChargeMaster Slow-Motion Video"
But does it still go BEEEEPPP? One was never able to turn this off before. That is why I bought the Lyman DPS III. Forget the Chargemaster, I gotta get me one of those cameras!